On arrival you will be greeted warmly and shown all of our wonderful facilities, your breath will be taken away once you see our beautiful views and listen to the birdsong. Soak up the views from your private deck or stroll down through the adjoining broadlough nature reserve. In the evening you can book a table in the award winning restaurant at Tinakilly or experience the sun setting over the Wicklow mountains. Our fantastic location overlooks the rolling countryside and Irish sea. Our cool chic belle tents are luxuriously decorated and have everything you could desire. 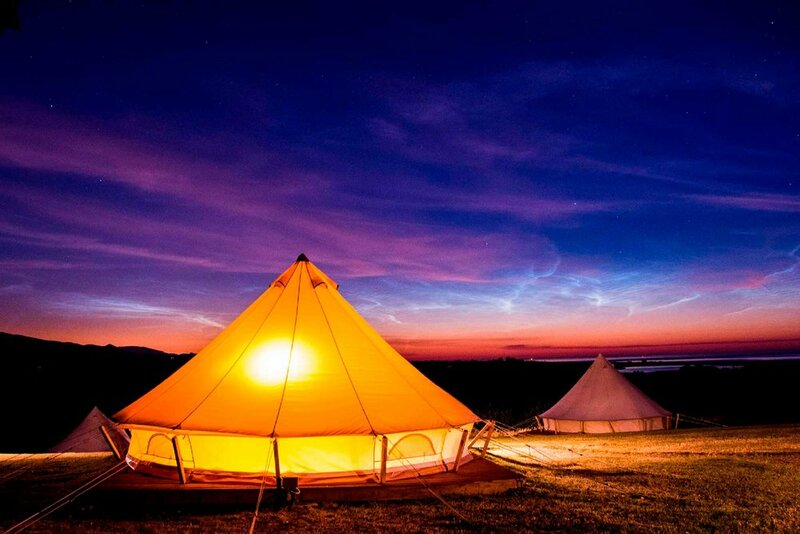 Private,hotel styled bathrooms located close to the tents make us one of the most luxurious glamping destinations on the east coast of Ireland. Whats more you will be so well looked after from arrival till checkout, enjoying a breakfast basket dropped to your tent in the morning. We are the perfect place to unwind and reconnect with loved ones and friends. A breakfast basket dropped to your tent in the morning. 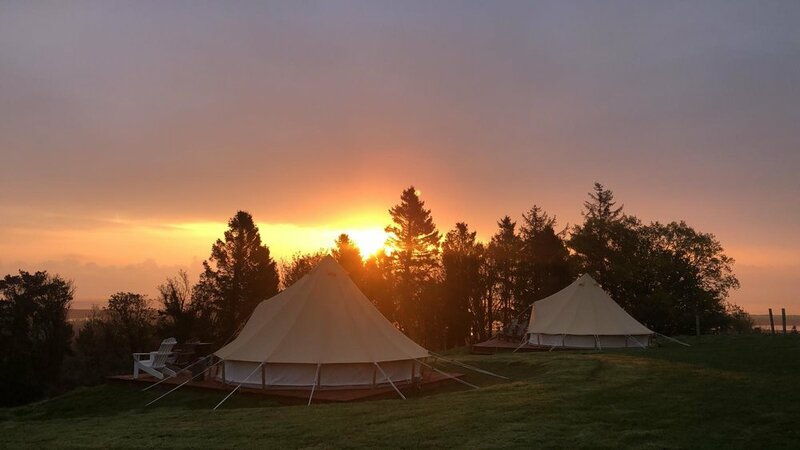 Each tent has it's own private full bathroom located near the entrance to the Glamping site, Hot showers available 24/7. We also provide fresh towels and toiletries. Put 'Knockrobin Glamping' into Google Maps or your Sat Nav. Alternatively -Take exit 16 south-bound off the M11., Take the first exit from the roundabout into Rathnew, Use the Tinakilly Hotel entrance from the main road, (if you pass a grave-yard you've gone too far) continue up the beautiful tree lined drive and turn left before the gate to Tinakilly Hotel. Turn right into our entrance at the first bend in the road. 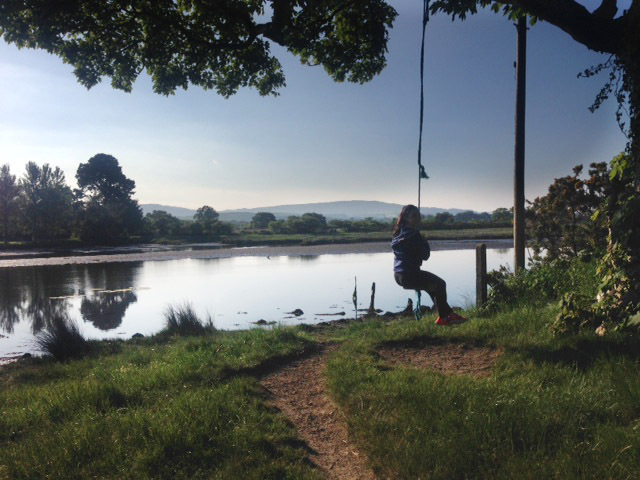 Take a walk out the gate and down to Broadlough lakes, it's about 1 hour return walk, or stroll the gardens at Tinakilly Country House, there's plenty of wildlife to spot; squirrels, rabbits, horses, wild birds, swans and farm animals.